....But it's too early to begin thinking about Thanksgiving. Actually it's not. If you want to order a natural turkey from a local farmer, now would be the time. If you like what I am about to suggest it would be time to order a smoker and make sure you are stocked up on hickory and apple wood. It is also time to choose something other than turkey, even go meatless if you so choose. Keep in mind that Thanksgiving is a celebration of the harvest, not 'turkey day'. You are not tied to a tradition sold to you by Butterball. But if you do choose turkey, smoke it. I like the Bradley. It is easy to use on a NY terrace and since it is electric you can use it legally. I understand that not everyone who will be reading this lives in an apartment, so if you have a house and space, any smoker you like will work. Just be sure to carefully monitor the temperature. 3 days before prepare your brine. Bring brine to a boil. Let cool and then fully immerse a bird (no more than 10 pounds) into the brine. Put something weighty on top to submerge and leave alone for at least 24 hours in the refrigerator. If you have to use a metal pot line with a garbage bag, otherwise plastic or glass is best. Take out of the brine and put on a rack uncovered in the refrigerator for at least 24 hours. This dries the skin insuring a a beautiful even color, not a soggy yellow. At this point you can season with Bell's, or a mix of your own. I like sage, thyme and salt rubbed under the skin and on the skin. 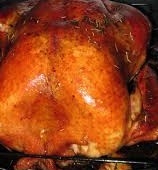 Rub the outside of your bird with olive or sunflower oil to insure even browning. To smoke put on a rack, not in a roasting pan, one rack below you can place a pan to catch juices. Use an electric thermometer in the thigh and set to alert you when the temp reaches 165. Keep your smoker at 250. Once the smoker is heated put in the wood. I use an even mix of apple and hickory for a turkey. I find the hickory to be a bit much by itself but apple alone is fine if you don't have both. 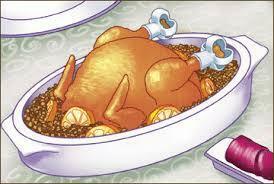 Smoke for 3 hours and then leave alone until the turkey reaches temperature. When the alarm goes off, remove and cover with foil, leave alone for at least 20 minutes before carving. Do not throw the bones away. Smoked turkey bones make a great gumbo base, or use them to cook red beans, or even just a smokey turkey noodle soup. The sandwiches will be so good you may look this article up and send me a thank you note... seriously, house smoked turkey with mayo and thin sliced sweet onion might change your life.